Brahmachari Marcelo was a monk of the Self-Realization Fellowship Ashram (monastery) for nearly twenty years. He was one of the most reclusive of all the monks and therefore little is known about him. I consider myself blessed to have been one of his closest friends during the fourteen years that I was a monk. After his unexpected passing, I feel it is my dharma to share his life so that it can inspire other spiritual seekers. I received a phone call telling me that Br. 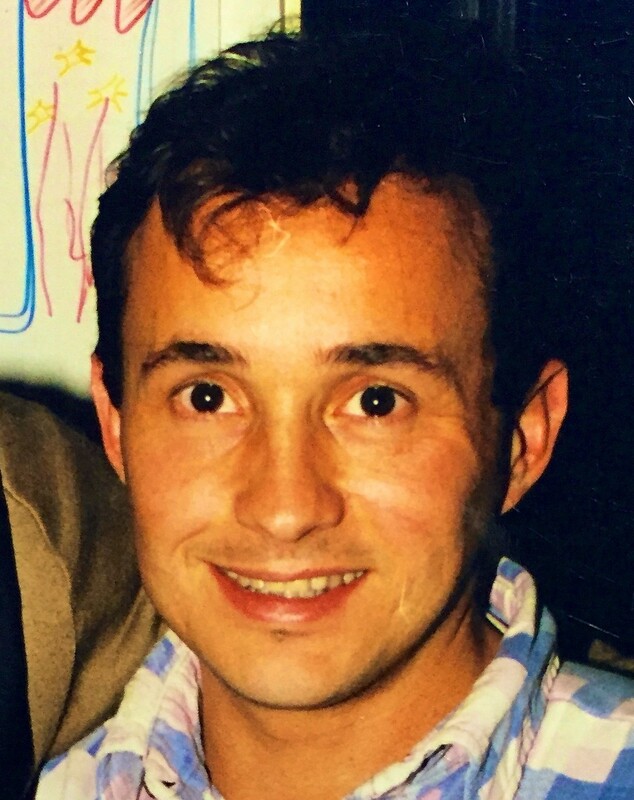 Marcelo had suddenly passed away in his bedroom on February 1, 2015, from natural causes. Tears filled my eyes. Memories of him have been flooding my mind ever since. I shall write candidly, from my heart. I consider him to be a saintly soul, a treasure of the SRF Ashram. I have decided to refer to him by his adopted spiritual name, Gangadhar [gaan-ga-dhaar], and sometimes Ganga for short. He liked the meaning of his birth name, “Ocean (Mar) and Sky (Cielo).” However, being a true renunciant, he never identified with that person. He only identified with himself as a passionate sadhaka (practitioner of yoga discipline), one dedicated to his ultimate goal of perfect love and kaivalya, liberation. He was a disciple of Sri Paramahansa Yogananda, who we referred to as Master or Gurudeva. I know nothing of his life before he became a monk, other than that in Brazil he went skydiving and loved it! Our friendship was based on our spiritual goals, not on what we had in common in life. I shall write about him as a sadhu, a holy man, for that is what he truly was. I first saw Gangadhar at the SRF Hidden Valley Ashram when I arrived there in 1996 to apply for the Monastic Order. Every Wednesday night there was a three-hour meditation. I was rather new and was very intimidated by that length. Much of the time passed with my eyes open, looking at the altar in prayer. After a month of this, I realized that each night the same person was sitting in the front row before the altar. There he sat, every week, in the exact same seat, wearing a snow hat with the yarn-ball thing on top. It was green and yellow. And it never moved I started to admire how he would sit there for the entire three hours without moving nor sleeping. He would spend over an hour—much longer than anyone else—with his hands in a form of the brahmari pranayama mudra, his elbows resting on a wooden support (SRF practitioners know this to be the Om Technique). Even now when I close my eyes I can see that image—the dim altar lights and the still figure of Gangadhar meditating, wearing his snow hat with that ball on top. I was inspired by his consistent dedication and stillness. I wanted to meet him. But he was very reclusive and shy. During the day I was assigned to work in the fields while he was working in the kitchen. He was busy serving meals when I had time off, and his breaks occurred while I was working. And so months passed and I never spoke with him. But when my eyes would catch his, he always smiled at me like a child. His eyes were large and brown. His face was round and young, although a few elegant wrinkles on the sides of his eyes showed me that he was older than me—I was 19, he was probably 29-32. His laughter was from the belly, slow and calm. He was never loud. When he spoke, I could hear a thick accent. I learned that his name was Marcelo Sanitas and that he was from Brazil. That explained his green and yellow snow hat. In Spring of 1997 I was sent to work at the SRF Mother Center in Los Angeles to continue with my application process. I never saw him for the next eighteen months, but always remembered the snow hat in front of the altar, motionless yet burning with life. In 1999, I entered the SRF Postulant Ashram in Encinitas, CA, a few months after Gangadhar arrived. We had just completed our application period of nearly two years. The postulant phase lasted about two years and was like spiritual boot camp, training us how to be an SRF monk. After that phase, one would be invited to take the Novice Vow, and would be assigned a position of work in the organization. After another several years, the Brahmachari Vow would be offered with further responsibility in the organization. The Sannyas Vow is possible only after one has been a monk for fifteen years, and is a vow for life, when one becomes a swami, or “Brother” as they are called in SRF. The SRF ashram was not a dreary, morose monastery. The spiritual life indeed can be very joyous and happy, but only if it comes from within. Gangadhar and a few others taught me how to make life in the ashram joyous from within rather than from the social life and culture of the ashram. It did not take me long to realize that Gangadhar was a black sheep. Not just culturally, but because of his temperament. And he was misunderstood for it—both by his peers and leadership. But can anyone be blamed for this? When we look at the lives of saints, they are always met with misunderstanding, even from loved ones. It is extremely difficult to understand the nature of such a soul. The mind says, "I know what a saint is," and it creates a false sense of security and knowledge. But when actual saints come along, we either fail to recognize them or we try to find some traits in them that do not meet our criteria for holiness. I do not claim that Gangadhar was a saint, but certainly a holy man. His inner joy was untouched by everyone else’s evaluations of him. Our daily work was gardening and landscaping to maintain the world class SRF Meditation Gardens in Encinitas. I was first assigned to work in the Nursery as an assistant to Gangadhar. There was a very ugly cactus-like thing dangling from a hanging pot. There were dozens of them. "What are these ugly plants?" I asked him. "Happy Feelings," replied Ganga with a serious look. For months every time I asked, that is the answer he gave me. Finally they bloomed, and it was magnificent. Then I found out they are really called Epiphyllum, or an orchid cactus. He came up with that wonderful nickname. Whenever I see those bloom, I think of Ganga's happiness. I observed that Gangadhar ate mostly fruits and very little of the rich foods. The Postulant Ashram rule is to eat what is served, and the food is very rich, with lots of fake meat, eggs and dairy. Ganga would take the absolute minimum. During breaks, when everyone could have snacks of their choice, he would eat more fruit. He was quiet, but never grumpy. He smiled all the time, yet avoided conversation. At times he seemed strained by all the talk and activity of the group; he just wanted to be left alone. But when the situation was natural and calm he was very fun, happy and pleasant. I myself had entered the ashram with a desire to live according to India’s tradition of sadhana. I entered with “a strong Hindu bias” as one monk observed. I knew that Yoganandaji had to adapt his organization and teachings to accommodate American attitudes and customs. But I had expected that within the ashram, an extraordinary world would exist. It was there, but it had to be discovered individually, creatively, esoterically. And Gangadhar helped me find it. For this I am eternally grateful to him. Over time, Gangadhar began to open up to me, sensing that underneath my youthful American personality, I was craving the yogic lifestyle that he lived. He did not disregard my enthusiasm as “youthful romanticism” or “spiritual immaturity.” And so, early in the year 2000, Gangadhar began to reach out to me by sliding inspirational notes underneath my bedroom door. As our friendship grew, Gangadhar and I would exchange many notes, mostly containing powerful quotes from holy texts and Yogananda’s writings. Ganga’s notes were carefully written, often using a ruler so that each line was perfectly spaced, and with different colors and drawings. So much time and care was put into them that I cherish them to this day. We continued to work in the Nursery, propagating enough flowers to supply the Rose Parade! In a short time, we realized that we could support one another spiritually. We formed a little trio—Gangadhar, another other monk (who I shall not name in order to respect his privacy) and myself. We often spoke about the great saints and sadhus and their extreme sadhana. These unconventional souls shook the heavens to receive the Divine Response, and, incidentally, shook up society and often received persecution for it. We each took a spiritual name to address our inner yogi, the atman (soul) that was yearning to reunite with Brahman (Spirit). 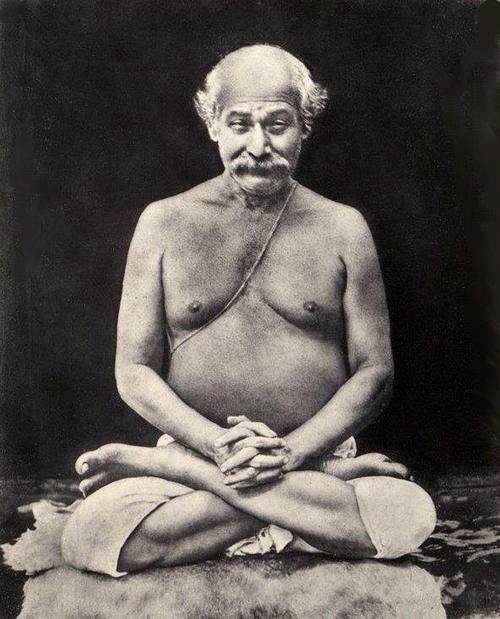 Original photograph of a Yogavatar, Sri Shyama Charan Lahiri Mahashaya (1828-1895). His name was "Gangadhar" in his previous life as a Himalayan cave-dwelling yogi. Gangadhar chose his name because the great Sri Shyama Charan Lahiri Mahasaya was addressed as “Gangadhar” by Mahavatar Babaji. Babaji told Lahiri Mahasaya it had been his name in a previous life when he was a Himalayan yogi, meditating in caves. Gangadhar is a name of Shiva and means Holder of the Ganga because the River Ganga (Ganges) flows through the jata, dreadlocks, of Shiva. Yoganandaji esoterically explained that it also refers to the Great Yogi who holds the flowing river of prana (lifeforce) within the spine, the sushumna—signifying yoga mastery. I took the name Chandi, the name of a boyhood friend of Paramahansa Yogananda. Our other friend took the name Jyoti. He was older than Ganga and I, and very intense about the spiritual life. He inspired us with his contagious devotion and perennial enthusiasm. The ashram training program did not emphasize long meditation. (Later on this changed, and at present a lot of the monks have six-hour meditations on Sundays). We were told that too much meditation in the beginning could lead to the bad habit of sleeping. Therefore, we spent more time working, learning monastic protocol, organizational skills, study of scripture and self-analysis. In the midst of work and activity, we were taught to “practice the presence of God,” which is the Christian way of defining japa yoga, or the repetition of mantra and devotional whispers to God during activity or meditation. Our little trio had a pact that we could remind one another to practice japa during work. Jyoti helped me more than anyone to practice this in the midst of activity, anywhere from movie nights to car drives. And Ganga helped me more than anyone to meditate deeply at night. I was discouraged by the lack of intense sadhana and kirtan in the ashram training, and so one day, in desperation, I revealed my heart to Gangadhar. I often daydreamed that I was a boyhood friend of the young Mukunda (the name of Paramahansa Yogananda in his youth), living a spiritual life with him in India. Mukunda would gather with his friends for late night meditations, devotional rituals and yogic austerities. There are many stories about Yoganandaji living that way here in America with some of his Western disciples. I wanted to experience this kind of life, but the ashram did not directly provide it in the way I had expected. Gangadhar consoled me and said, “We can try to create that life ourselves, right here and now.” And so, we made a pact. The ashram rule was lights out and asleep at 10:00pm. We were to wake up at 5:30am for meditation. Gangadhar’s plan was to wait until the lock-up duty was finished and all lights were out. He would meet me at 10:30pm and we would go out to the second floor deck. There we would sit, facing the ocean, and meditate all night until 5:00am. Our friend Jyoti was in full support, but he chose to stay in his room. We slowly edged alongside the floorboard, tiptoeing past the other bedroom doors of the fifty-foot long hallway. The last two bedroom doors belonged to monks on staff who would have stopped us and reported our misdeed to the monk in charge. My fear of this possibility caused me to make a wrong step right onto a loud squeak. My heart stopped beating. Ganga ran quickly into the nearby community room, waiting to see if we were caught. The coast was clear and so we proceeded out onto the small deck that had a low wall around it for sunbathing in privacy. We rolled out our mats, wrapped up in blankets, and began our sadhana. Our agreement was that we would not talk, nor sleep, we would tap the other if he was sleeping, and we would not give up trying. If our legs were tired, we would do some simple stretches on the floor. If we could not meditate, we would open our eyes and do japa yoga. I remember the night so well. The sound of the ocean went on, hour after hour. My mind was shifting into another paradigm; the impossible was possible, the command of sleep was broken, the monotony of life became silently adventurous. I admired Gangadhar’s stillness. Only a few times did he stretch his legs. At this time, Gangadhar had been practicing Kriya Yoga for about ten years, while I only had a few years’ practice. I looked up to him as a big brother. Being tired and blissful was a new experience for me. The next day my eyes burned and my mind was a bit slow, yet I felt a reservoir of a subtle happiness and peace that lasted all day long. Sometimes I would just laugh for no reason. I was in awe that I actually stayed up all night sitting outside striving to meditate. Working with Gangadhar during the days after our nightlong meditations was special. We never talked about the meditations, we just had a silent understanding and camaraderie. Jyoti would come by the Nursery and we would talk about spiritual things. At times, we all had smiles and our eyes watered up with joy. Gangadhar knew the value of balance. He knew we should not overdo it in the beginning. He chose the nights carefully, usually with a purpose. In the summer of 2000, an auspicious purnima (full moon) night was approaching. I can’t recall which one it was, but I remember that it was summer time, so I now assume it was Guru Purnima. The day before the purnima it was announced to us all that we were going to Disneyland. Everyone cheered with joy. We were to awaken extra early that morning. But Gangadhar and I decided to meditate all night anyway—as he would say, “There will always be a reason not to meditate. God must come first.” His determination changed my life—he was a Godsend, inspiring me to reach out for goals that I never would have attempted to attain alone. And so we sat out on the sun deck from 10:30pm to 4:30am. At 5:00am everyone else woke up and prepared for the long day at Disneyland. I spent that whole day with Gangadhar. It was one of the most transformative days of my life Nothing seemed to bother me. I did not crave any special foods nor did I get excited about any rides. I did not resist anything nor fear distractions or temptations from the material world. Gangadhar and I would look at each other throughout the day and smile like two teenagers suppressing an inside joke. I would ride roller-coasters sitting next to him and we just laughed like children. When the other monks debated over which ride to go on next, or what to eat, we would just smile. At the end of the day, the monk in charge gave us the special privilege of splitting up into groups of three for one last ride (this was quite a treat after spending the whole day stuck in one big group). I looked at Gangadhar and said, “Let’s go on the ride It’s A Small World." Many think that this ride is for children. The other monks looked at me and rolled their eyes. We needed one more to join us, but nobody wanted to go on that ride. Then, feeling sorry for us, a longtime monk who liked us smiled and said he would go with us. I still remember that ride at night with Gangadhar. To this day it is the best joyride I’ve ever had. The world truly was small, ever so small, as we floated by on our raft of joy. The other nightlong vigil that I will never forget was Christmas of 2000. In the 1930s, Sri Yoganandaji had set up the tradition of a meditation dedicated to Christ that lasted over eight hours. This prospect is quite intimidating to those not accustomed to long meditation. My first Christmas meditation in 1999 was tough. But during the whole year of 2000 I had been meditating with Gangadhar during the nightlong vigils. And even though there were nights when it was very difficult to stay awake or concentrate, we experienced tangible progress. Even Ganga told me how grateful he was for my commitment. And so this Christmas, I was ready. All fifteen of us postulants came up from Encinitas to Mother Center (in LA) the night before the meditation, and we had to share just two rooms and sleep on the floor with mats and sleeping bags. One of these rooms was a small office room that nobody wanted. And so our little trio volunteered to stay in that room so that we could have seclusion from the others. I am sitting with Marcelo Gangadhar, SRF Ashram, Christmas 2000. During the all-day meditation, I sat next to Gangadhar in a backless chair that the monks used, but Gangadhar sat on the floor with just a few other monks who were able to do that for the entire eight hours from 10am-6pm, with a break halfway through. The meditation was very special for us because Sri Daya Mata (the spiritual leader of SRF, who had lived with Paramahansa Yogananda for over twenty years) led the final hours of the meditation. When it was over, we returned to our small room. The joyous anticipation we felt was tangible. We were swept away on this adventure and everything else paled in comparison. We never told anyone about our meditations. Intimacy with God loses something if it becomes out in the open, unless it is shared with very close friends who would not obstruct our sadhana. Besides, we knew that our counselors would not permit us to do this. I'll never forget this dear old bench. We met on a wooden bench that was behind some trees. The bench faced the back of the large Mother Center building. We sat there and began our sadhana. We never talked or planned the sadhana, we never prayed out loud. For several hours I could hear monks happily talking and laughing in the community room. The contrast to our silent meditation was surreal. After midnight, the talking faded to a few whispered conversations. Then silence…and moonlight. Ah, the moon. As it rose higher, it illuminated the white ashram building. The silence became inflamed with sadhana, yearning, and the extraordinary world opened up for us. The momentum of the previous day of meditation and the determination of Gangadhar kept me fully charged all night. I had a burning anticipation within me that something special was happening, and that the magical and mystic experiences I had read about could actually become a reality in my own life. I felt as if Yoganandaji was with us as the young Mukunda, when he took the name Yogeshwar and formed a small group of friends that wanted to be sadhus and run off to the Himalayas. The bluish light of the moon and the cool night kept both of us fully awake and focused in our meditation. The nightlong meditations of that Christmas are reason enough for me to be eternally grateful to Gangadhar. The experience completely changed my view on life and what was possible. It redefined my limits, set a new standard, and brought the spiritual life from books and dreams to the here and now. I was so moved by this experience that I photographed the bench, considering it to be a holy place in the journey of my life. One late night we were walking in the gardens at Mother Center to go meditate in the outdoor Temple of Leaves. It must have been sometime in 2003, and the two of us were on another quest beyond the ordinary. We walked to the old tennis court where, decades before, a platform used to be placed for Paramahansa Yogananda to give diksha (initiation) to disciples. The significance of that place was very holy, but it was still just a tennis court. Without waiting for my response he went on the ground and began rolling on the court. I followed, and for about ten minutes we silently rolled all over. Most of the monks would have thought this comical. But it was very powerful. I learned the value of taking Gurudeva’s words literally rather than taking them as merely inspirational or as a novelty. A number of monks who were very different from us would try to relate to Ganga, but only on their level, never trying themselves to adapt to him. I remember once when there was a social event planned at night, he did not show up. The leadership sent me to order him out of his room. This was the code of obedience and group spirit. This happened several times. I'd knock and he would open the door with his earplugs in, his room dark except for his little shrine where he was meditating. He was grave in expression, resenting having to leave his sadhana for a social gathering. He did not smile. He knew that I was also upset, but he was not afraid to show it and let that friction breathe. He did not “gloss over” it. He used it as fuel for his inner yearning and determination. He would come downstairs obediently, but would be sure to make his point by sitting in the corner with eyes closed. He would be told to do some task, or one of the counselors would engage him in conversation. There was a sincere attempt to include him, but also an attempt to change him, to shake him out of his mood. But I saw it as a divine mood, very internalized. Others saw it as self-centered and pretentious. It was a difficult situation, but somehow he managed it. Gangadhar was always searching for wild fruit. He found fruit growing from all sorts of hidden shrubs and trees He loved guavas and picked enough for all. He never just picked for himself. He knew that another way to be a part of the monastic community was to be generous. So in his free time he picked large baskets of fruits to share. On Sundays we had the day off and we were to fast until 4:30pm. Then we could eat whatever supper we wanted, individually. Ganga always wanted to fast for longer periods, but fasting was against the rules—the leadership considered this and other types of intense sadhana to be extreme, or vain, or imbalanced. Perhaps for some it was so, but not for a sadhu like Ganga. In order to comply with the rules without compromising his ideals, he would make huge fruit salads for himself and eat at the table with the group. Gangadhar introduced me to the Feijoa (pronounced Fe-joy-uh) or pineapple guava. Encinitas Ashram had a row of about forty shrubs. They would fruit in the Fall. On Sundays I had a hard time meditating in my room because it faced the noisy Highway 101. We were not allowed to go to the beach or walk in the Gardens. I felt trapped. So I eventually figured out that I could hide under the Feijoa tree, meditate, read, and eat those awesome fruits all day! As I sat there, I heard a loud sound behind me. I turned apprehensively only to see Gangadhar smiling at me. “Good, you found this place,“ he said. “Let’s find the sweetest tree,” and we proceeded to have an elaborate taste testing session. About fifty guavas later, we awarded first, second, and third prizes. It was so fun to be with him in that way, so simple, wholesome and natural. Years later when we were at Mother Center (LA) together, we would meet late at night after our sadhana and go to the main kitchen—Ganga liked it better when nobody was there. We would go to the fruit crates and feast. During persimmon season, he would instruct me to pick out all the overripe ones from the crates and scoop out the good part. In this way, he explained, we were doing a service to the community and we were not being wasteful. And by saving the best ones for everyone else, we were being humble and selfless, which he said was very important for a yogi. Even though Gangadhar loved the sun and meditated for hours out in the heat (never burning, thanks to his Brazilian skin), he was extremely obsessed with caves. He found one in the Gardens underneath the canopy of a grouping of Melaleuca trees. We would go there during the day, even in the midst of duties. We would work hard bringing up flowers so that we could sneak into the Melaleuca cave and practice Kriya Yoga for 10 minutes and then jump back out into work. We would often meet Jyoti there too. The idea was to follow our Gurudeva’s metaphor that a bhakta (devotee) must be like the drunkard who always sneaks in a sip of alcohol in order to maintain a steady level of inebriation. This practice became so important to me that Jyoti and I continued it after Ganga moved. The Nursery had several sheds made of cinder blocks. They were called "The Snake Pits" because snakes would hide in the tarps stored there. Ganga used to meditate in them. Then the sheds were demolished and he no longer had his little meditation caves. But he kept searching for new caves, and in the spring of 2001, Gangadhar happily informed me that he had discovered a magnificent tree cave. “We must be careful because it is in the Forest Area.” This was an area near the nun’s quarters. Gangadhar came to my door at 11:00pm. This would be an interesting challenge. First sneak out of the ashram building (not just to the sun deck) and walk all the way over to the nun’s area without being discovered by any of the monks who were free to walk around late at night. We succeeded, but then something strange happened. I shined my flashlight over to the tree cluster and I saw a white shirt move. We walked closer and saw that it was one of the newly arrived postulants. He was not very clever, wearing a white shirt! The next morning, the monk in charge held a meeting to tell us all that a postulant monk had been spotted walking around the ashram grounds at night after 10:00pm, and this was against the rules. He scolded the entire group and said we are our brother’s keepers and should not let another monk break the rules. He said that the animal who leaves the pack is the first one to be killed by the predator. Conformity and staying with the group is our only security. He then went on to say that any of us who wants more meditation is just being egotistical, because if we can’t experience God in the scheduled meditations, how will we expect to in our own meditations? It was a heavy talk. Gangadhar came to me afterwards and said, “We have to be careful. Don’t let the others know.” I realized that the talk did not make even the slightest impression on Ganga. He then cracked a little joke, pretending to whip me, and saying in a dramatic voice, "You must sssssuffer!" We laughed. This was his way of taunting the archaic (yet often still present) religious idea that self-imposed suffering is necessary and happiness is egotistical. So we laid low. I loved that cave, but my favorite spot was on the cliffs overlooking the ocean. We went there a lot too, though it was totally against the rules and off limits. I went there alone often, especially near the Hermitage caves. Even after Gangadhar was transferred to Mother Center in Los Angeles, I kept up my night vigils along the cliffs—all those wonderful, prohibited places are forever holy in my memory. Two to three times a year, monks are given a weeklong retreat for more meditation and a break from the demands of cloistered life. Gangadhar took this to the extreme and refused to talk to anyone during these retreats. The ashram rule is that a monk can never be alone on retreat. But Gangadhar somehow figured out a way to be alone. He would get reprimanded, but it did not deter him. For a few years he managed to fool the ashram managers. There was an orchard near the Hidden Valley Ashram that was owned by SRF but operated by some other people. On that property there was a tiny shed that was converted into a bedroom with a toilet and sink. Gangadhar managed to spend his weeklong retreats confined to that cottage, eating only fruits, surrounded by Nature that he loved so much. Once he even managed to combine his two retreats into fourteen days straight in that little cottage. We laughed, but I got his point. Being serious about various yoga practices and kriyas, Gangadhar dedicated himself to perfecting the Kechari Mudra. This mudra is not for everyone and it is not encouraged or taught within the ashram, even though Paramahansa Yoganandaji wrote about it. Gangadhar never paid attention to what the ashram counselors said, he did what Yoganandaji wrote and what he read about in books about saints and sadhus. And so he and Jyoti were convinced that Kechari Mudra would help us go deeper. The mudra is described in several texts of India that are accessible to the public. And some of its principles are important in the practice of Kriya Yoga. My explanation here is not breaking any of the codes of secrecy. Basically, the yogi must be able to strengthen and stretch the tongue so that it can curl back to touch the uvula (little tongue) and even further back to the nasal passage. In some variations, the yogi can plug up either the left, right, or both of the nasal passages with his tongue in order to regulate breathing for certain pranayama and kriya. Gangadhar decided to use every opportunity to develop this ability—including meetings! I first noticed his strange facial expression as he started practicing during meetings. The skin between his neck and chin would expand almost like a blowfish as he curled back his tongue within his mouth By this time in his monastic life, everyone already knew that he would not participate in the meetings, even though he had to sit there for the sake of obedience and conformity. And so nobody else noticed what he was doing. Or maybe they just thought he was doing some neck exercises or something. I chuckle now remembering when we were having lots of these meetings. The ashram leadership was trying new processes of communication to change the culture of the organization. One outside consultant was training us in his patented Synthesis method. We were at the Lake Shrine in the Summer of 2001, with about forty graduated and older monks. In a huge half circle we all faced the moderator who guided the meeting. I sat a few seats away from Gangadhar and Jyoti. I was my usual self, participating just enough to avoid ruffling feathers. But they were both meditating with eyes closed. Gangadhar was sitting cross-legged (he always sat cross-legged, even on chairs.) At one point, about two hours into the meeting, the moderator asked everyone to introspect deeply and read all the notes that were projected on the big screen before us During the pervading silence, I heard a loud snorting sound. I look over at Gangadhar who had apparently got his tongue stuck up in his nasal passage during Kechari Mudra. I was on the verge of laughing out loud. He opened one of his eyes and looked around to see if anyone had noticed. Evidently, no one thought much of it other than a strange sound. Then he caught my eyes and I winked at him. He smiled and closed his eyes and resumed the Kechari Mudra. In 2009, Ganga wrote a brother monk (who gave me a copy of the email and permission to print) about the Kechari Mudra. Until the end of his life, Ganga was always supporting others to experiment and excel in yoga sadhana. The Synthesis meeting lasted a grueling five hours. I cannot remember much of it, save for my own controversial statements which I was terrified to utter, and for Gangadhar’s occasional snorts. Towards the end he made an unforgettable comment. Though the moderator tried unsuccessfully to include Gangadhar (the Synthesis rules prohibit forcing someone to speak), he finally managed to kindly persuade Gangadhar to say something. It was part of a brainstorming session about Core Values for monastic life. Gangadhar ceased his practice of Kechari Mudra in order to speak. His voice was strong, very slow and calm, resonating from the abdomen upward. His diction was still childlike and his accent very Brazilian. It was quiet. Synthesis rules prohibited anyone from commenting, and so Gangadhar had a rare moment free of any verbal ridicule or laughter that usually follow radically spiritual comments. About five long seconds followed and then he added, “Meditation…and…Simplicity.” Then he closed his eyes, which seemed a sufficient signal to the moderator. But then, before the moderator began to speak, Gangadhar opened his eyes and added, “Thank you,” smiling at the moderator, and then closing his eyes. He was so thoughtful. Gangadhar loved saints. He read books about the unconventional and radical saints, sadhus, and yogis from all various traditions and religions. He would find rare photos of them and email them to me. And he also loved emailing me PowerPoint slideshows that he found on the Internet of very colorful pictures with fluffy music and Portuguese text, all about spiritual ideas. He told me that he liked the beauty and devotion of the slideshows. This was so typical of Gangadhar—on one hand an intense cave sadhu from India, on the other hand a childlike lover of flowers and beauty. ganga wrote gave this note to one of the monks, who later shared it with me after he read the first version of this article. 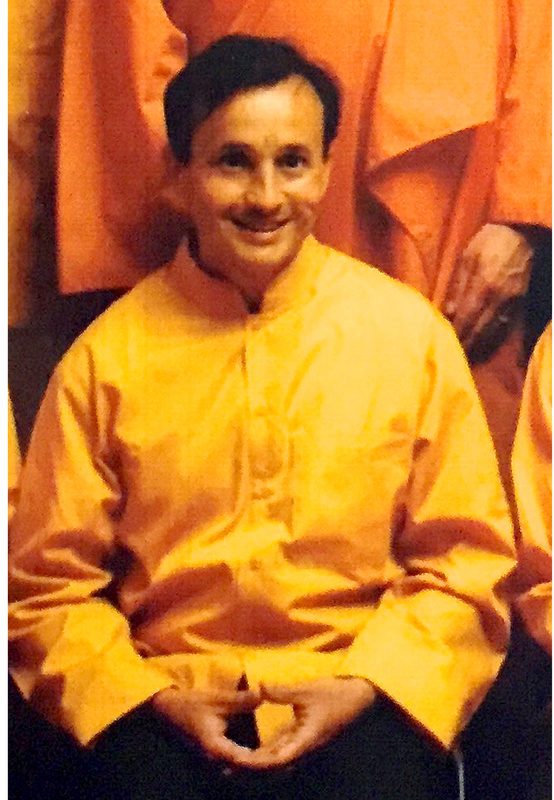 Gangadhar took his Novice Vow in the later part of 2001 and moved out of the Postulant Ashram and into the larger monastic community at Encinitas. He was reassigned to work in the Monk’s Kitchen, which was separate from the Postulant Ashram. I missed him a lot, but Jyoti and I carried on without him. During that time, he was assigned to lead the morning group meditation for the monks one day out of the week. I remember how I was worried that he might not do well because of the pressure to do everything correctly in front of the all the monks, including the ones in charge. But he did well. The monk leading meditation has the freedom to choose his own prayer to lead the group in. The first prayer Ganga chose was a simple one of Sri Yoganandaji's that he had memorized. Then the meditation went on for the usual 35 minutes. At the end, I could see that Ganga had gone very deep. As we all stood for the closing prayer, I remember how beautiful his voice became. His eyes remained intently closed. It was so simple and profound, the shortest prayer I had ever heard in a group. He said it with such sweetness and inner strength. Years later I came across the ancient Sanskrit prayer with the same meaning: Lokaha samastaha sukhino bhavantu. Gangadhar was eventually transferred to live at Mother Center and he was assigned to work in the Archives Department. Not long after, I was transferred to Mother Center in the spring of 2002. There were thirty-two rooms in the large dorm, and about ten were open for me to choose from. I found out where Ganga lived and was overjoyed to find an empty room across from his. At the new location, we did not meditate out at night anymore because of the bad mosquitoes. During the cold months, we went out a few times, but we seemed to be content with meditating in our rooms across from each other. Sometimes we did meet, however, especially around Christmas. During the day on Sundays, I would often sit in the monk’s orchard, where the weightlifting gym was built. Ganga would be in his small shorts rolled up to look almost like a loincloth, basking in the sun, meditating for hours. He would walk over to one of the trees or shrubs and pick a few fruits. I loved joining him on these sunny days. He loved the pomegranate tree nearby. One day, one of the monks cut the tree severely in order to make room for one of the pieces of exercise equipment that was part of the gym. Gangadhar was so sad and did not understand how they could do that. We visited Encinitas together one weekend and hoped to meditate in our special tree cave in the Forest Area, but we found that it was all trimmed, the dead wood removed, and the cave all gone. For a time he and I were plotting some way of secretly digging caves on one of the hillsides at Mother Center, but we never took action! During my first year at Mother Center, I began to settle into the freedom there (after the training period in Encinitas) and began to chant more. I have always loved kirtan and bhajan, and this was a time for me to rekindle that fire after having it suppressed in the postulant ashram. I also began practicing simple arati in my room, which involved the ringing of a small bell. But dear Gangadhar found all of this distracting. He asked me to reach up to tape over a crack of light that peaked through a huge black canvas curtain that he hung over his window. He proudly told me how he figured it out and offered me a roll of canvas to do the same. I accepted. I tried to be like him. I lived in complete darkness for a few weeks, without chanting much. But then I realized it’s not my temperament. We both became uncomfortable. It was difficult, I have to be honest. I’m a natural communicator, but he was not. And his English was limited. Yet we loved and respected each other, and that is the key. With a lot of patience and trust, we spoke for an hour. At the end of the talk, we both reached a mutual understanding that we were different types of yogis, both paths were valid, and we had to support one another. A few weeks after our talk, Gangadhar came to me told me that he needed me to help him perform a special tapasya (intense discipline). I promised him total support and secrecy But now I can openly share this. Gangadhar had found a small cement storage box. It was strange, I’m not sure what it was for. It was behind the Mother Center building, covered in ivy on the hillside It was solid cement, and very small—about 4 feet by 4 feet square, with a wooden padlocked door. He brought me to this thing and told me his plan. I would lock him inside on Friday night and hold the key until I would come to let him out on Sunday night. He would make sure he had no duties that weekend, and his hope was that nobody would look for him. I was to cover up for him if and when someone asked me his whereabouts. One of ganga's favorite pictures of Sri Yogananda, taken in india during his time of intense sadhana. I agreed with one condition: that I would check on him several times by secretly approaching and saying “Om Guru” and he would either knock three times or say “Om Guru” in return so that I would know he was okay. Agreed. During the year of 2002-2003, I helped him about five or six times with this tapasya. He would bring only a blanket and a small photo of our Gurus. No water, no food. For 48 hours. When I would open the small door for him on Sunday night, I would help him out and walk quietly back to his room, making sure we did not cross paths with anyone. He would take the key from my hands and we would touch foreheads and pranam. No words were exchanged. Several times I had to cover up for him. He was assigned a counselor who was instructed to make him more social. The ashram was determined to make him more balanced and prevent him from becoming a reclusive. I would like to think that if the highest leadership knew of his sadhana, they would have supported him. I believe that an ashram should strive to nourish its saints and sadhus, however eccentric they may be. Therefore I supported his secrecy with full faith that his determination and tapasya were pleasing to Gurudeva and Divine Mother. I know that the few white lies I told to his counselor about his whereabouts were totally justified, and if I have to pay some karmic debt for those lies, I gladly take responsibility for the payment. It is an honor that I could lock that wooden door and protect the tapasya of my dear brother in God. Gangadhar began to support my love for sacred music. He himself tried to learn some chants on the harmonium. He had a tiny one that was half broken. I would hear him trying to play it. Whenever he was around me and a harmonium, he asked me to chant Om Song, his favorite chant. He also drew, by hand, a cheat-sheet guide for reading music for me to use. I wish I had saved that. Sometimes he would smile at me and say, "Sri Chaitanya found God through chanting. It's good." During this time, Gangadhar was working as an office assistant in the Archives Department, and as far as I knew, he was enjoying his job and the department supervisors where happy with his work. Most of the time he was alone, labeling boxes and files and entering data. This was perfect because he loved to be alone. But his spiritual counselor was still after him, trying to pull him out of seclusion and giving him a lot of extra duties. One day his counselor told Ganga that he must adopt a hobby. This was a common practice—my counselor also gave me the same instructions. Their intention was to prevent us from becoming isolated and depressed, which they assumed was likely to happen if we stayed too focused on sadhana or chanting. Gangadhar resisted as long as he could, but then he had to give in. To my surprise, he chose violin. It took me some months to realize the brilliant “chess move” he played. By choosing violin, he more than appeased his counselor, and by engaging in such a loud hobby, the rest of the community quickly learned of “Marcelo’s violin playing,” which everyone thought was charming. It had the effect of diverting everyone’s attention away from his extreme spiritual practices. There was only one place he could practice without disturbing the community—in the small office beneath the kitchen, which belonged to the Archives Department. It was sound proof and totally dark. Gangadhar would play violin and then meditate. He learned only a few simple songs, but far more importantly, his counselor left him alone and Ganga kept his little cave! My life drastically changed in December 2004 when I was assigned to be the Assistant Housebrother (Assistant Director) of the Postulant Ashram. This assignment was a divine blessing and the best years of my ashram life. The position was normally given to monks much more senior to me. The newly appointed Director whom I was assisting brought in many of the very things that I felt were missing—long meditations, Indian culture, a more natural and multicultural approach to building fellowship, more free time and respect for individualism. Living in Encinitas prevented me from seeing Gangadhar more than a few times a year. I kept in touch with him, and he seemed to be doing well. During the annual Convocation event in LA, I would see Gangadhar more active in administrative tasks, or acting as a translator with the Brazilian and Portuguese devotees. Our monastic careers were moving forward. When we would talk, we exchanged words of spiritual encouragement. We mostly talked about the risk of getting too satisfied with our roles in the organization, rather than “burning up the ether with longing” as Sri Yoganandaji said. Work could so easily become an excuse to forsake deeper sadhana. As we found our place in the ashram and "moved up in the ranks," we reminded each other that position, name and seniority were all meaningless in the spiritual life. As Yogananda once said, "The minutes are more important than the years." We both took the Brahmacharya Vow together in March of 2006, along with Jyoti. It was a very sacred and joyous occasion for us all. Ganga was very happy to take the Vow because he always wanted to be a sannyasi (a Swami). His renunciation was powerful, his dispassion was evident, and his childlike joy and sweetness were genuine. Some busy years sped by and we didn’t have much communication. But when we would reunite, it was fun. At times we would be able to spend a weekend retreat together at the Lake Shrine, or at Hidden Valley. We would always meet to meditate at night, either outside if the weather was nice, or in a secluded place like a small chapel. In 2010 I began to make my decision about leaving the ashram life. I talked briefly with Ganga about it and he was very simple: "Love God and deeply meditate, wherever you go." He knew me well and he had a sense why I was leaving. He was envious that I could go to India. He really wanted to go. I am sad that he never made it to our spiritual motherland. I left the ashram on the Fall of 2010 with support from my superiors and at the same time with indescribable grief, because I knew that the monks would be encouraged to cut off communications with me. This is the SRF rule. I was essentially losing my friendships and the ashram brotherhood, and a career which were all developed over the span of fourteen years. And they were also feeling great loss because I was much loved and was helping the leadership in the ashram. But Ganga never saw it as a loss. He saw everything in terms of sadhana. If someone continued to meditate more deeply and expand his love for God, there was no loss—even if that person was not living in the ashram. And if someone lessened his spiritual desire and practice, becoming mediocre, there was a great loss—even if that person lived in the ashram. Then he looked more deeply into my eyes, and he could see that I was still grieving having left the ashram and being away from my spiritual brothers. Then I smiled at him and said, “You must ssssuffer!” and we both laughed. The last time I saw him was a year ago, in 2014. We bumped into each other on the street near the ashram. We smiled lovingly at one another while talking, as if underneath our casual talk our souls were gratefully reminiscing of our times together. I thanked him for all he had done for me. He knew that very few monks are ever permitted a trip to India. SRF only sends a few, and most of the ones that go have already been in the ashram for over twenty or thirty years. There is a possibility that his comment was a premonition of his early passing. Ganga longed to live with the sadhus and yogis in India, away from the world, away from the rules and complexities of an organization. Yet here he was, a Brazilian, dressed in the SRF monastic outfit of brown slacks, yellow polo shirt, leather shoes and nicely trimmed haircut. But inside he was a cave dwelling yogi, keeping his sadhana and his ideals burning vibrantly in his heart while playing a role in his Guru’s organization. Even Paramahansa Yogananda deeply missed India during his years in America. In the crucible of adversity, Ganga proved his spiritual strength and devotion. I have written about the challenges in the ashram in order to show Ganga's resolve. There were many beautiful aspects in ashram life. I met exceptional friends that I still cherish to this day, even though many of them are encouraged not to communicate with me. There are saintly souls in the ashram, Gangadhar was certainly not the only one! Some of my close friends are thriving there, while some have recently left. Every organization is "a hornet's nest,” as Yoganandji said. Yet he founded one, with full knowledge that it would have flaws, but do much greater good. Just like all of us, an institution is a mix of flaws and virtues and is always evolving. I feel it is important that Br. Marcelo Gangadhar is known for what he truly was, a sadhu, a yogi, a holy man, right here and now in modern times. As I have written, he changed my spiritual life forever. If he had lived in India, or in a traditional ashram, he would have already become a swami, not because of an organizational promotion or for reaching a set number of years to prove loyalty, but because of his intense sadhana, his dispassion for the ways of the world and society, his love of Nature and simplicity, and his disciplined tapasya that came from his own will rather than from a rule or a schedule. He was like an exotic wildflower that suddenly sprouted up and bloomed, not fitting or blending into the garden. Some people admired the flower and recognized its auspicious appearance, while some tried to move it, trim it and make it blend into the landscape. This flower brought joy and inspiration to many people, and I hope that these stories I've shared from my heart will be a continuation of his encouragement to all. As with all holy personages in India, the time and day (on the Lunar calendar) of their passing is made public, therefore I have done my very best to estimate it. Based on information from some of the monks who live in the same dorm as he, he passed away in the late afternoon of Sunday February 1. In the Vedic calendar his passing occurred on Magha Chandramasha, Shukla Paksha, Chaturdashi Tithi.